H4 Work Authorization, Work Permit or H4 EAD and H4 Visa Issues: Can an H4 EAD open his or her own business and can the H1 spouse transfer to this business? Can an H4 EAD open his or her own business and can the H1 spouse transfer to this business? This is probably the most interesting question that we get on a daily basis. 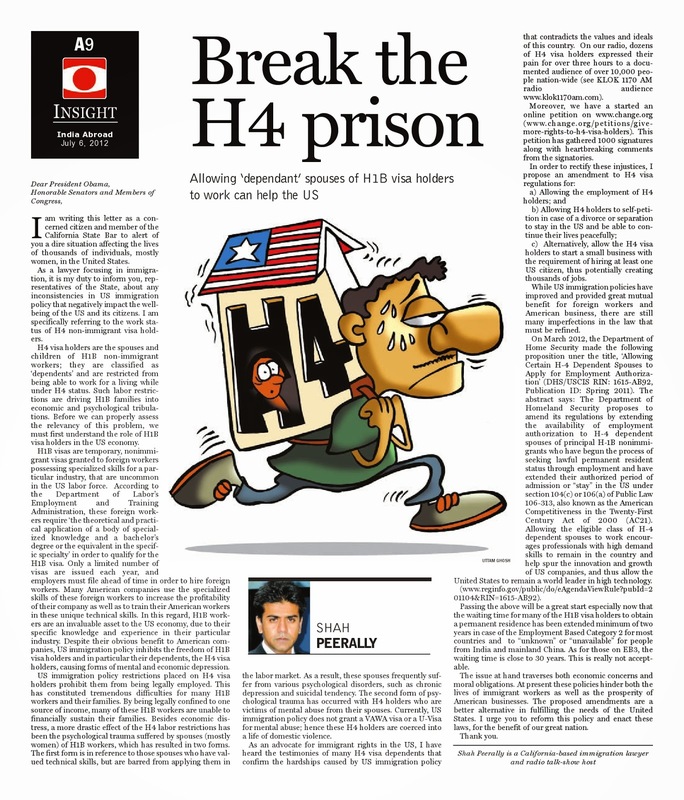 The simple answer is yes because the H4 EAD unlike the H1B has no limitations on opening ones own business(es). In fact, when we pushed for this immigration reform for the H4 EAD new rules, one of the arguments we made to President Obama was that H4 visa holders have a potential to create new jobs. Therefore it is time to prove that the H4 EAD holders can actually make a difference in the society. Having encountered and listened to thousands H4 pain, and having witnessed their determination, I will not be surprised that the H4 group can actually become a driving force in the economy. Can the H4 EAD open a company and transfer the H1B spouse in the company? Well, if it is a small business it will be almost impossible to obtain an approval on the H1B transfer because it will be "self-serving". However as the business grows and have a 'big board members' and many shareholders, it might actually be possible to transfer the H1B spouse. At this point, the answer is not clear. However, we hope that it will be possible. My advice to all the upcoming H4 EAD holders is that you should actually follow your instinct and open your own business(es). The ideas which were flowing from the H4 visa holders while they were in pain was amazing. I think if they put this idea into business plans and create businesses, it will not only benefit them but also the United States. If you need help on any immigration question, including H4, H1, PERM Labor certifications, I-140, and so on, feel free to call us at (510) 742 5887.